Arash Derambarsh is a successful publisher who also serves as a local politician in a suburb of Paris, France. But he knows what it feels like to go hungry. As a young man going to law school, he was often quite poor, getting by on just one meal a day. So whenever Darambarsh saw French supermarkets and restaurants throwing out perfectly good food, all he could think about was the many hungry people who would love to have that food. On his own, Derambarsh started reclaiming unspoiled food out of supermarket dumpsters. Every night, about 100 poverty-stricken people would line up to get this food, most of which was still in its original packaging. 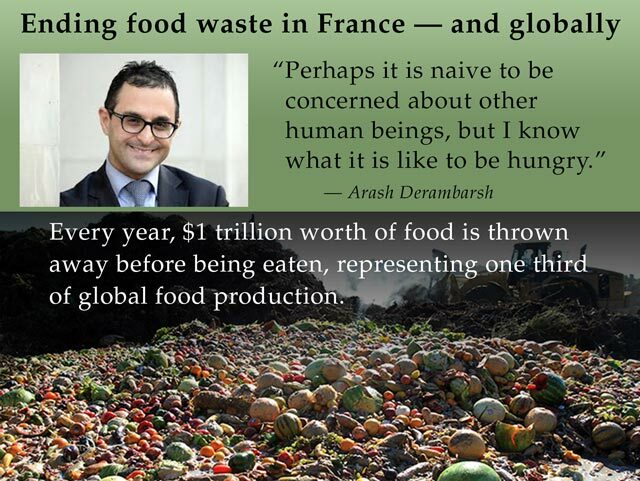 When Derambarsh realized how much food is wasted in France every single day, he wrote an amendment to the country’s annual budget bill making it a crime to throw out food that is still edible. The amendment passed, and the new law will soon go into effect all across the nation. Supermarkets will now have to partner with local or national food charities, so their unsold food can feed people who need it. Arash Derambarsh wants to bring this idea to the rest of the world, where one trillion dollars of uneaten food—or 1/3 of the food produced in the world—is thrown out each year. Derambarsh says his idea will accomplish two goals: feeding the hungry and helping the environment. There is also an environmental cost to food waste. About 20 percent of the food that is tossed out ends up in landfills, where it decomposes. This causes a nasty smell and attracts insects. More importantly, it produces methane gas. Methane is a “greenhouse gas,” meaning it contributes to global warming. There is also a cost to the environment of producing more food than is used. That’s because food production requires a lot of resources, like water and fuel. Perhaps the bigger tragedy is that while all this perfectly good food is thrown out, there are close to 50 million “food-insecure” people in the U.S. People who are “food-insecure” are not able to buy all the food they need, or they do not know where their next meal is coming from. 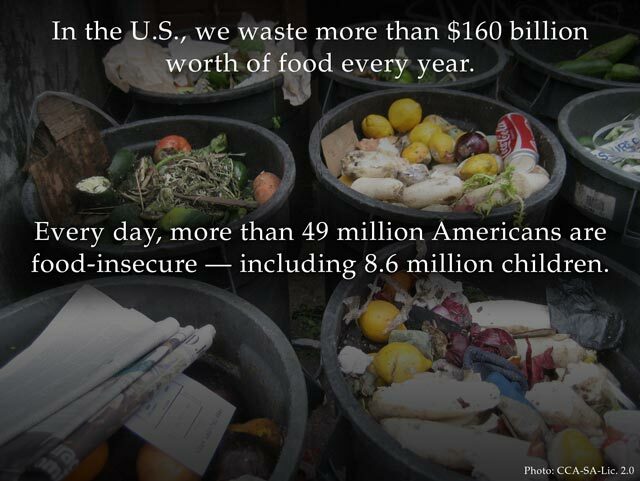 More than 49 million Americans, including nearly 9 million children, are considered food-insecure. Redistributing even a fraction of U.S. food waste would make a huge difference for many across the country. So what do you think? Is food waste a problem? What’s the solution? Could a plan like Derambarsh’s work in the U.S. or other places? Previous Makeup Forever by Caroline T.